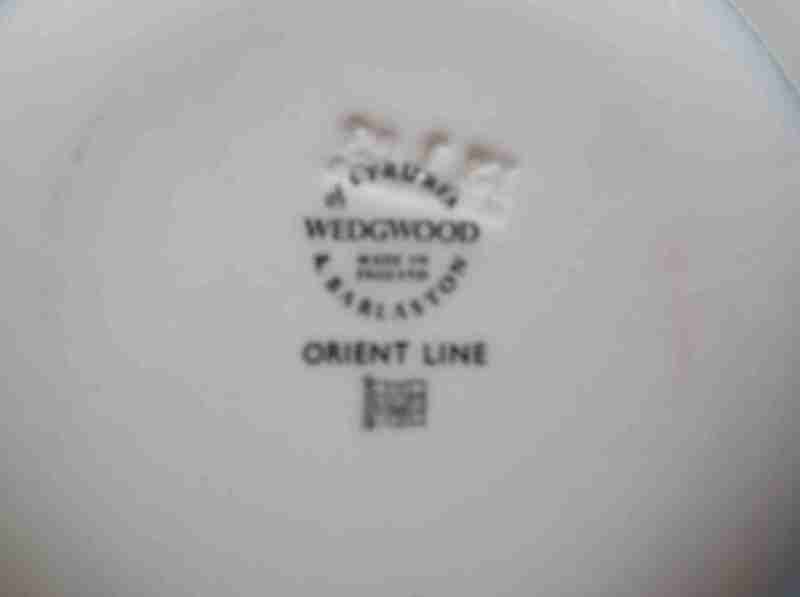 DESCRIPTION -- Wedgwood design dessert bowl as used on board from the Orient Line shipping company. It is dated circa 1960's and shows on it the traditional company design and logo in the centre. It is bottom marked Orient Line and the Wedgwood mark and is 6" (16.5cm) wide and is in an excellent condition with no chips (click on the picture to see the bottom mark detail on the base of the item). HISTORY -- The Orient Line's beginnings can be traced back to the formation of a ship-broking company by James Thomson in 1797. The company was operating a small fleet of sailing ships by the early 19th century, and by the middle of the century they were sailing on routes all over the world. Scotsman James Anderson joined James Thompson & Co. in 1828, his nephew James George Anderson joined the firm in 1854, and by 1863 it had been restyled Anderson, Thompson & Co. With the death of the last member of the Thompson family it was restyled Anderson, Anderson & Co. in 1869. 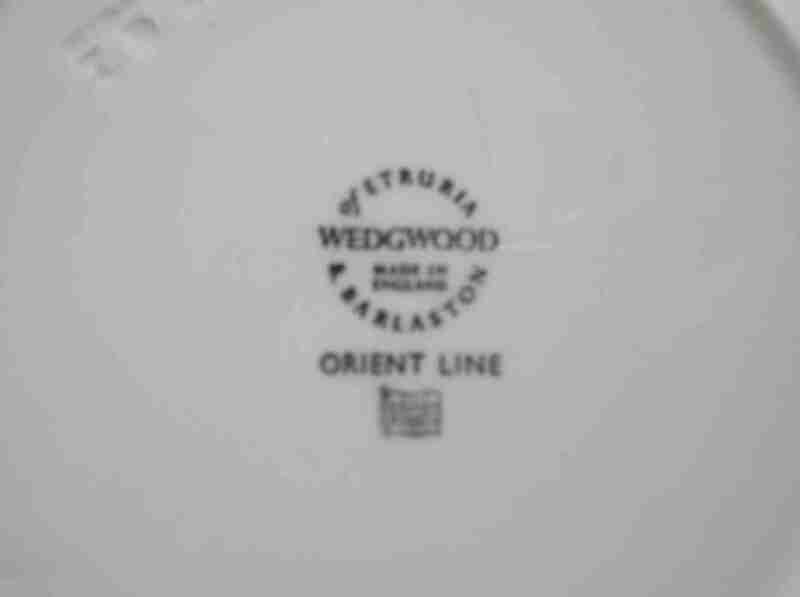 DESCRIPTION -- Wedgwood design dining side plate as used on board from the Orient Line shipping company. It is dated circa 1960's and shows on it the traditional company design and logo in the centre. It is bottom marked Orient Line and the Wedgwood mark and is 6" and in an excellent condition with no chips (15cm) wide (click on the picture to see the bottom mark detail on the base of the item). DESCRIPTION -- Pair of original design jacket badges from the Orient Line shipping company and are in an excellent condition. HISTORY -- The Orient Steam Navigation Company, also known as the Orient Line, was a British shipping company with roots going back to the late 18th century. From the early 20th century onwards an association began with P&O that eventually culminated in the Orient Line being totally absorbed into that company in the 1960s. The Orient Line's beginnings can be traced back to the formation of a ship broking company by James Thomson in 1797. DESCRIPTION -- Early style lapel pin badge from the Orient Line shipping company which shows on it the company houseflag and is in an excellent condition. DESCRIPTION -- From the Orient Line shipping company a coffee cup and saucer in the traditional green colour and is in an excellent condition. The items would have been used on board and are Wedgewood pieces and are bottom marked with the company name (click on picture to see bottom markings). DESCRIPTION -- Original as used on board china dinner bowl from the Orient Line shipping company which is produced in the traditional 'shell design' pattern to its edge and is bottom marked with the company name. The size of the large dinner bowl is 9" (23.5cm) wide and in excellent condition and very collectable pieces. DESCRIPTION -- Original as used on board medium sized china dinner plate from the Orient Line shipping company which is produced in the traditional 'compass' design pattern to its edge and is bottom marked with the company name. The size of the dinner side plate is 8" (21.5cm) and is in an excellent condition and this design dinner service is very collectable. DESCRIPTION -- Original pair of dining forks as used in service from the Orient Line shipping company which are in a great condition. HISTORY -- The Orient Steam Navigation Company, also known as the Orient Line, was a British shipping company with roots going back to the late 18th century. From the early 20th century onwards an association began with P&O that eventually culminated in the Orient Line being totally absorbed into that company in the 1960s. The Orient Line's beginnings can be traced back to the formation of a ship broking company by James Thomson in 1797. The company was operating a small fleet of sailing ships by the early 19th century, and by the middle of the century they were sailing on routes all over the world.